Godehard Sutmann from the Institute for Advanced Simulation (IAS) at Forschungszentrum Jülich has been appointed professor for High-Performance Computing in Materials Science at the Interdisciplinary Centre for Advanced Materials Simulations (ICAMS) and the Faculty of Mechanical Engineering of Ruhr Universität Bochum. Professor Sutmann is head of the High Performance Computing group at ICAMS since 2012. The group develops and implements algorithms for a more efficient use of simulation methods in materials science. The group has strong links to the Jülich Supercomputing Centre and all three departments at ICAMS. 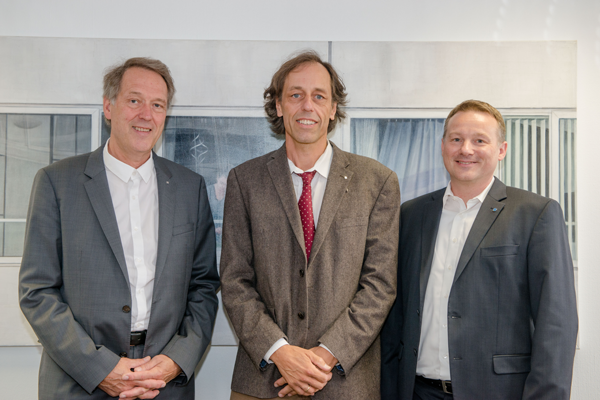 Rektor Axel Schölmerich, Godehard Sutmann and Alexander Hartmaier (from left to right).